The first entry in my Pizza and Video Game series was pretty much a no-brainer. I wanted a relatively short game that was iconic and not brutally hard. The best representation of all of my parameters is the game Portal. Portal was released just over a decade ago. It is a fairly short puzzle game where you wake up in a laboratory and run through several experiments testing a new device that creates “portals” within the laboratory. You eventually control the entry and the ending point of these portals in an attempt to navigate through the levels of this experiment. Some surfaces are portal-able while others are not. Sometimes you need to utilize momentum and physics to fling yourself further. These start easy, but then build on one another to create increasingly complex puzzles. The game is very well designed. There is no point during the game where you feel that things are unfair or require knowledge you have not accessed. You can figure out what you’re supposed to do without feeling like the designers were smoking The Crack. One issue I personally had with Portal is that there was a point at which I could not continue with the game. I could only get through level 17 when the puzzles became too difficult. They weren’t difficult in regards to the logic required to figure out what the solution was. They were difficult because they required a degree of fine motor skills and coordination that I simply don’t possess. I have tried getting through Portal several times, but I always got stuck at a certain point because I couldn’t do things fast enough to pass certain levels. The Boyfriend noticed that I tend to not use the controls properly. He noticed that I would work the camera and the movement controls independently rather than synchronously. We are going to start working through the Halo because that is one of the first games to utilize the camera and movement controls together so that I can get more used to this design pattern in games. Even beyond my lack of experience and comfort with the controls, the game becomes significantly more difficult in the later levels. 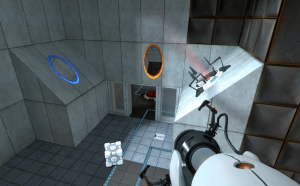 I had spend several years hearing people tell me that Portal was a very quick and easy game. I went in with the expectation that it would be so, only to run into a brick wall towards the end of the game. I wound up having The Boyfriend complete the last two levels of the game for me. Otherwise I may not have finished. Or if I had it would have taken all weekend. There are a few incredibly fidgety puzzles that required an incredible amount of timing and precision. I know a lot of gamers really want a challenge, but it would really be nice to have something that would be accessible to people with physical impairments who can figure out the puzzle but can’t react as quickly. It was interesting to see a lot of patterns in Portal that are “borrowed” by other games. The secret rooms with the warnings about the AI and the cute song at the end of the game feel kind of like the post-credit sequences in Marvel movies. They were a completely new thing a decade ago but have been used by so many people in the intervening years that it’s hard to remember how innovative it was at the time. I did also appreciate that the two characters in the game were both female. The AI being female I understand. Between Siri and Alexa it’s just kind of a default for computers to have female voices, but the choice to make the protagonist female was really cool. I always appreciate it when creators don’t just default to male protagonists, even though in this case you only see Chell in passing if you see yourself before you go through the portal. I feel our first Pizza and Video Game day was a success. I feel like Portal was the perfect kind of game to do for something like this. I am a little sad that so many gamers feel like games have to be a hundred hours long to be worth the money. I worry about the number of games that I can actually get done in a day, but I will worry about that another time. For now, I am glad I finally got to see all of Portal, even though I didn’t complete it myself. Until next time!